Southern Spit Roast & BBQ Co. offers you a number of catering options, and tailor-made menus to suit all sorts of requirements. You can choose from the traditional spit roast menu, BBQ's, finger-food buffets, seasonal menus and delicious desserts. We also provide a delivery service and offer discounted menus for those on a lesser budget such as the express option. 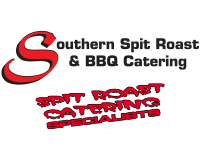 Whether you are looking for onsite catering, offsite catering or delivered catering, Southern Spit Roast & BBQ Co's professional catering services will make your function, party or wedding a long lasting pleasant memory for you and your guests! The Southern Spit Roast & BBQ Co. spit roast specialists will prepare and serve your food with great care and attention.